The air is crisp, the leaves are crunching under foot and pumpkin is everywhere. This recipe from thekitchn.com caught my eye and I am so happy I tried it. The cookies are tender and delicious. The pumpkin flavor is subtle, but present. The texture is cake-like. 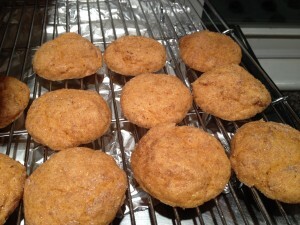 They are easy to make and would be delicious with a cup of hot cider (or pumpkin spice latte). Preheat your oven to 325°F. Line a baking sheet with parchment or a Silpat. In the bowl of a stand mixer (or in a large bowl with a hand mixer), cream together butter, the sugars, and the pumpkin puree until it's smooth. Mix in the eggs one at a time. In a separate bowl, stir together flour, tartar, baking soda, and salt. Slowly stir in the dry ingredients into the creamed mixture. Mix it just enough to combine the ingredients, but try not to over mix the cookie dough. In a small bowl, stir together sugar, cinnamon, and ground nutmeg. Measure out heaping tablespoons of dough. Roll the cookie dough into a ball and then roll it in the sugar mixture. Place the rolled cookie on the baking sheet. Repeat until the dough is gone. You should get about 18 medium-sized cookies out of the batch. Bake the cookies for 11 to 12 minutes until they are slightly puffed and golden brown around the edges. Let the cookies cool before serving. Keep extra cookies in an airtight container for up to 3 days. •	Be sure to use pure pumpkin puree and not pumpkin pie mix for this recipe.